For an ever-growing population of under-banked or unbankable Americans, tax season presents a certain quagmire – how can they receive their tax refunds in a timely manner? Traditionally, the IRS either mailed out paper checks for deposit into a bank account or they direct deposited refunds into a taxpayer’s checking or savings account. But for 9 million Americans, that’s simply not an option. Fortunately, there are many prepaid debit cards that eliminate this problem. This week, we take a look at a few of those prepaid options, along with the various fees associated with those offers. There’s sure to be on one that meets your needs. First, it’s important to select a prepaid card that the IRS has on its approved list. You can review that list on the IRS website. That said, there aren’t many that aren’t approved, so you shouldn’t run into any problems. Also, many offers will note whether or not it’s acceptable as a tax refund debit card, so do your homework. 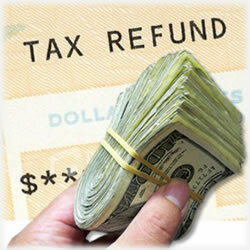 The Turbo Tax Visa is a great choice as a prepaid debit card. First, it’s reloadable, which makes it useful year round and it’s made especially for those with no bank accounts. Not only will the IRS deposit your refund onto this debit card, but it can also be used for direct deposits from your employer or your monthly government payments. It eliminates expensive fees at cash checking businesses and most taxpayers say the turn-around for their tax refunds is fast – usually within seven days. Use this handy prepaid card for shopping and paying bills online, too. Approved by the IRS, the NetSpend Visa offers card card holders an optional savings account that pays 5% APY and if you’re thinking this is a rarity, you’re right – not all prepaid credit card offers do this (and likely won’t in the near future), so for those wishing to take control of their financial future, this is a strong reason to consider this offer. Opening your account takes only a $10 initial deposit and you can have the $5.95 monthly fee waived when you enroll in direct deposit or make at least one monthly balance inquiry. Also, it’s available as a Visa or MasterCard. This is an instant-approval choice and is issued by Meta Bank. It too is on the IRS approved list of debit cards and there’s no annual fee for using it. Your service fees are based on one of two accounts – and you can decide which one works best for your needs. The Premium Plan has a $9.95 monthly fee while the Classic Plan will cost you $4.95 each month. Use this prepaid card for direct deposit or reload it in millions of places. Want to pay your bills online? Select the Premium Plan and you’ll be using it to cover all of your online expenses. Be sure to explore the benefits of this prepaid option. We’ve reviewed this card in the past and with it’s many benefits, it’s a natural fit for those looking for the right prepaid debit card for their tax returns. No worries about approval – it’s guaranteed and you can carry a balance of up to $10,000. This is one of the highest balance allowances found on the market today. There are no overdraft fees or minimum balances you must maintain. The complimentary Credit Score program is ideal for those looking to build or rebuild their credit history. Your minimum balance is $10 and there’s a $9.95 application fee. Monthly fees are waived when at least $1,500 is direct deposited each month and if it’s not feasible, the $3.95 monthly fee is a reasonable fee. Finally, it’s FDIC insured, so rest easy knowing your money’s safe. This isn’t an all-inclusive list, so be sure to review all of the prepaid debit card options. Again, it’s crucial you ensure the IRS will place your tax refund on your debit card, so check out Uncle Sam’s website before choosing. Another important factor is the terms and conditions – especially with prepaid offers. The fees will vary greatly from one offer to another, so know what you’re getting before you apply.